Critically-acclaimed mystery novelist, Steph Cha, visited Pasadena City College in October, 2016 to share stories of her writing life with students, faculty, and visitors. In workshops, a reading and an interview with Inscape Magazine, Cha described the launch of her amazing career as the world’s first Korean-American author of feminist noir mysteries set in Los Angeles. In addition to writing novels, Steph Cha is the noir editor for the “L.A. Times Review of Books” and a regular contributor of articles and reviews to the Los Angeles Times, USA Today, and Trop Magazine. Her more than 2000 restaurant reviews on Yelp have led to her role as protégée to L.A.’s top food critic, Jonathan Gold. A graduate of Stanford University where she double-majored in English and East Asian Studies and Yale Law School, she now lives in her native city of Los Angeles with her husband and two bassett hounds, Duke and Milo. 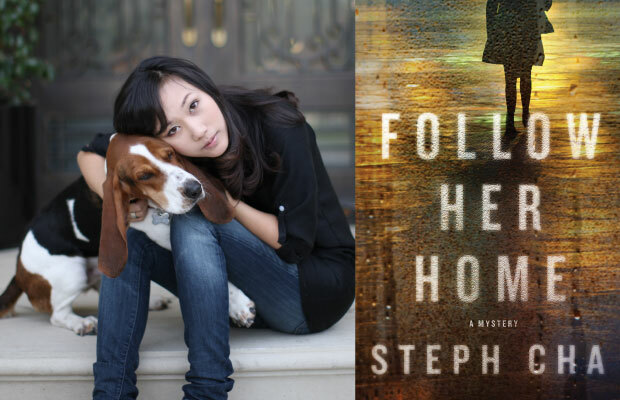 Steph Cha’s first novel, Follow Her Home, introduces her protagonist, Juniper Song. Song is a twenty-something, Korean-American admirer of tough guy Philip Marlowe, hero of Raymond Chandler’s noir detective stories of the 1940s. Reviewers praise Song as a contemporary female voice with a sharp sense of humor, intelligent, literate and courageous. In Follow Her Home, readers encounter the dark secrets of Song’s past as well as the heart-breaking events of her initiation into the private detective game. 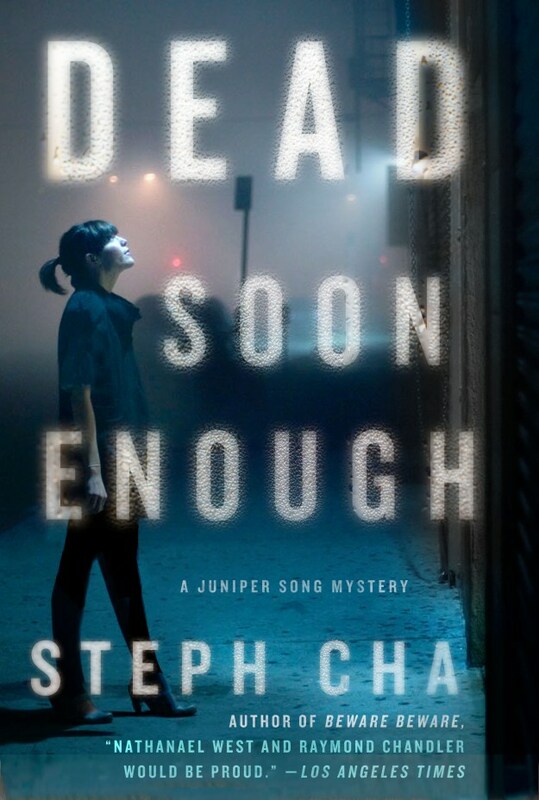 Two more Juniper Song mysteries followed in as many years, Beware Beware and Dead Soon Enough, both beautifully written, tightly plotted, and set in a closely-observed Los Angeles. How did you decide to write mysteries? One of the things that appeal to me about mystery—there are a lot of things that appeal to me about the genre—but in terms of crafting one, to be honest, I thought that writing a mystery novel seemed more approachable because the structure of it was pretty contained. I’m writing a crime novel now, and it doesn’t have that private investigator spine so it’s a lot harder. I took a class on American Detective Fiction in college, and a professor in a lecture said that it’s actually a very conservative structure. There are two or three threads that seem not to be related and then at the end there’s a convergence. I think most novels tie up loose ends in that way. The underlying structure of a mystery novel is that it tends to coincidence. That really appealed to me because PI novels are linear and first person—mine at least. I was able to write forward without worrying too much. I was able to just move it along pretty organically knowing what places I wanted to hit. For all of my novels there were things I figured out as I was going along. I generally have an idea of themes I want to explore and then a mystery to get me started. As I was saying about this convergence and getting these threads to converge, I don’t always know how that happens. I’ll sit with these stories a year or a year and a half and then I’ll figure out that structure of many threads. They kind of come together. There’s a sense of urgency and speed and things come together and kind of snap in place. I like seeing that in fiction, but I like it to have these convergences come out of the relationships organically. I don’t plot everything out in advance. I know what I want to convey. The plotting is not mechanical—it’s more fun than that—it’s like the solving of a puzzle. You graduated from Yale Law School—does that help in your writing? Actually, no. Law study itself doesn’t help. There is a huge tradition of lawyers becoming novelists, but I didn’t really have a legal career. I did temp work and by the time I graduated from law school, I had the draft of my first novel written and knew that’s what I wanted to do. I don’t really have enough of a grasp on legal procedural stuff to write it well, but I’m also so much more interested in family stuff and community stuff than I am in systemic stuff. It’s not worth it for me to do that research. I wrote the first draft of my first novel (60,000 words) while I was in law school. Student status leaves gaps of time so I was able to steal time. I do find legal issues interesting. I have had lawyers in my first and third books. There’s a law firm full of sleazy lawyers in my first book, and I definitely worked someplace like that. I think that I went to law school right out of college not knowing what else to do. I had an English degree and I think there are a lot of us that had no idea what to do next. I don’t regret going to law school. I met my husband and made some good friends. It was a valuable experience. A writer can turn any of their experiences to good use. Being a writer was always my pipedream. I always read a lot of fiction and thought novelists were special magic people. I didn’t know any writers back then, but I always read a lot and always loved books. We’ve learned that you’re a food critic and a reviewer for Yelp and that you’re also a gamer. How does that fit together? I did have to stop playing Candy Crush. I’m an obsessive game player. I play Pokemon Go like a fiend. I just get addicted to these things. I get really obsessive and I have to force myself to stop. The Yelp stuff is a little different. I can do it if I want to. I just like writing about food when I don’t think it’s work. Writing Yelp reviews is a stress-free hobby. It’s an easy kind of writing and I enjoy eating and writing. I can do Yelp and write a novel at the same time. I’ve written 2700 reviews at this point—I’ll be Yelping until I die. I generally post one or two Yelp reviews a day and they’re pretty long. I don’t really sweat how good they sound. I just write and I’m pretty thorough. It’s not like my writing writing—I don’t labor over the sentences—it’s more like a log. It’s also a way to keep myself reflexively writing every day. I don’t think it’s coincidental that I started writing Yelp when I was writing my first novel. 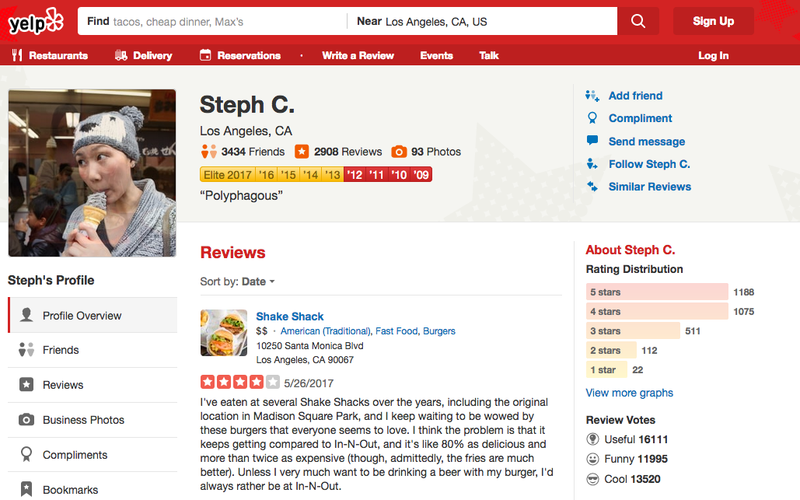 I’ve written about a million words on Yelp and that adds up to something. It’s become this weird part of my identity. I got the LA Times food reviewing gig through Yelp. I met Jonathan Gold, he checked out my Yelp, and now I’m his favorite Yelper. This also led indirectly to doing book reviews for the LA Times. I found my editor through the LA Times and Yelp—and I am a good book reviewer. You understand addiction which is important for writing your novels. You also kind of apologize for being a “slacker” because you go dormant sometimes. Could that be a description of the creative personality? Well, I think I do waste a lot of time. I’d like to tell myself I’m always working in the background, but I’m not. I don’t have a day job and I don’t have kids, so I have a lot of unstructured time. I have a sort of murky quantity. I don’t have to do any sort of thing on any given day. I’m a terrible multitasker so it’s better that I work on one thing at a time. I admire people who have so much going on in their lives, and they’re able to produce quality work. I hope I’ll be able to do that when I have kids. I don’t take advantage of this bounty of free time that I have. I don’t have much self control. I definitely try to have deadlines—having deadlines really helps me—and I do fear the possibility that I’ll stop writing or stop producing. A lot of the action in your books takes place in West Hollywood, Hollywood, and central L.A. What are some of the spots that you go to for inspiration? I think my inspiration comes from thirty years of living in L.A. Over time, I’ve gotten to know a lot of neighborhoods. I grew up in Encino but going to Koreatown a lot and different parts of the Valley. I’ve lived in central L.A.—Los Feliz. Part of being an Angeleno is that you end up driving a lot. One of the things that appealed to me about the Chandler novels was the setting, getting a view of a city through this character having to interview different people. That’s the appeal of a PI to people—a very mobile figure. My characters go all over the city. The PI figure has to do that. The book I’m working on now, a literary crime novel, takes place in Northridge and Palmdale. Those are far out areas of L.A. and I’ve gone there to do some spot research, to get a sense of what it feels like. I do visit sites, take photos and find details to use—real world anchors. For example, in my first book there was a car accident. I went to that intersection to do some research so that I could have a strong sense of anchoring in the real world. Also in books two and three, Juniper Songs lives in an apartment overlooking the Echo Park Lake. From her apartment, all you could see for two years was this tarped-over fence because they were redoing the lake. While I was writing, the lake opened and so I have the lake reopening towards the end of book two. I had to go to the lake and take a walk around. On that first walk, I was paying special attention and taking lots of pictures. I found a detail to use that I might not necessarily have used had I not been paying attention. I noticed there was fresh gang graffiti and I used those details in the book. Do you consider yourself an L.A. writer? I consider myself an L.A. writer. It’s a long tradition, and it’s weird how L.A. is one of the most culturally rich, vibrant places in the world and yet our literature plays second fiddle to other places, like New York. We get slapped with those Hollywood stereotypes, and that’s such a small part of us. Also, our literature has been historically white and male, and I think that’s strange because of our cultural diversity. My generation of L.A. writers is more diverse, a very mixed group, and I feel like what everyone’s doing is—well, it feels new. I think of myself as part of this tradition, but I started writing my first book wanting to challenge a lot of the mythology of Chandler’s books. Not that it wasn’t true, but that it was an incomplete version of L.A. I was definitely also invested in writing about a Korean-American Los Angeles. People haven’t written a lot from that perspective, and I find that interesting because we have the largest Korean -American and ethnic Korean population outside of Korea. I think it’s time there’s a literature for that. I grew up going to Korean church. My whole Korean family emigrated to the U.S. in the 60s and 70s and all of my aunts and uncles lived here (between Hacienda Heights and Granada Hills). My mom had a cell phone store that had a Korean clientele and at one point she ran a Jewish deli in a Korean neighborhood. My grandma lives in a Korean-centric area, too, and she has her routines—keeping her TVs permanently set on the Korean channels and going to the Korean grocery. There’s this whole experience of being a Korean-American family, and I’ve never seen it written about in L.A. so I wanted to write about that. Would you ever consider writing a screen play? My second book is being optioned and we’re kind of in the middle of it. I’ve been screenwriting. It’s one of my side gigs so I’m working on that now and it’s almost done. It’s my first screenplay and it’s kind of a learning experience. The skills are comparable but it feels different than writing a book. Prose just plays more to what I want to get out of writing, but I like screenwriting. It’s just the thing that L.A writers gravitate toward because you can make a living at it. I feel like more young people should be writing fiction—particularly the mystery. The mystery world is really old, and it’s really white. I‘ve been in rooms of 50 people where I’m the only person of color and the only person under 30. I feel like the literary world always needs new blood. I feel like as Latino and Asian as L.A. is, it always comes out 80 percent white, and I think that’s weird and unnatural. I always want young writers of color to be working at it. Conducted in person in October 2016 at Pasadena City College during Steph Cha's Writer in Residence time at PCC.